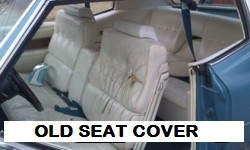 These seat covers will install the same way as the originals using the plastic J-Clips, hog rings and listing pockets required by each individual vehicle. They are sold as kits and you can purchase a Front, Rear or the Complete Set depending on your needs. 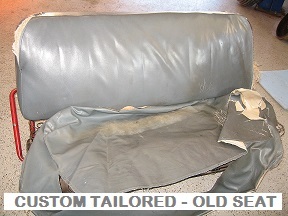 We do not offer partial section pieces such as driver seat cushion, driver backrest, etc. Leather - We offer and stock many current leather colors that are reproduced in the aftermarket. Since we do not stock all colors there are times that we will require a sample piece of the original be mailed to us for matching. Our Premium Kits will always have the actual seating areas done in leather with the remainder of the trim sections done in the matching vinyl. Vinyl - There are many more shades of vinyl offered in the aftermarket. The same color matching process applies to vinyl as with leather. Cloth or Cloth/Vinyl Combination - This is important! In many cases the original factory cloth materials may not be available for your vehicle. Although there are many aftermarket automotive cloth materials that can be used as an substitution they do not match what is presently in your vehicle. If you would like to check availability for your vehicle please enter the information in the below form and we will review and return a reply within 24 - 48 hours. These are tailored made to fit your vehicle but offered in selected Design Layouts only. 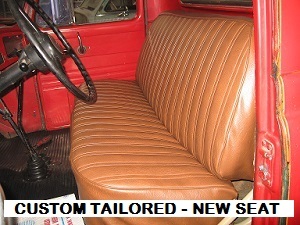 A great alternative for those older vehicles that we do not offer the Factory Original Sewn Style patterns. These seat covers do not come with plastic J-clips, listings and/or Zippers/Velcro hardware for installation - but they will have additional trim materials added to the perimeter for the hog ring installation to the springs. They are made to fit each vehicle's actual seat configuration but are only offered in the 4 Primary Design Layouts for this line. Vinyl - We offer dielectric heat sealed Pleated Vinyl. Single Pleat, Double Pleat and Bold Pleat. Each type has its own color selections. Cloth or Cloth/Vinyl Combination - The cloth materials are 2" Stitch Pleated in either a Tweed Cloth or Velour Cloth. Leather - This is NOT an option for this seat cover line.